Try A Destin Sailing Cruise On Your Vacation. Have you ever wondered what it was like to sail in the old days? You can experience that thrill. The Nathaniel Bowditch is a traditionally rigged, steel hulled sailing vessel, and is a copy of an old time sailing vessel. To get all the details just visit Nathaniel Bowditch sailing, below. Nothing compares with the feel of a ship surging through the water, powered only by the wind! You can feel the winds power, transmitted through the deck, yet you hear only the sigh of the spray on the hull. Sailing is an adventure even smaller family members will enjoy. Just click the nathaniel bowditch button. The Nathaniel Bowditch is a 54 ft, traditionally rigged, steel schooner. 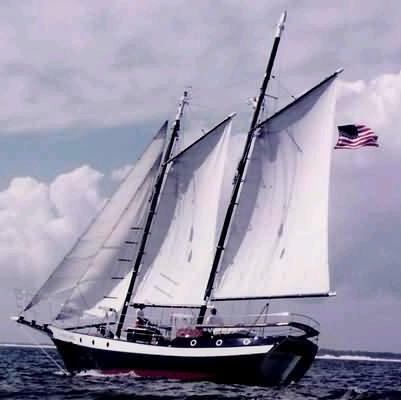 She is a familiar sight along the Destin coastline, and the first sailing experience for many Destin area visitors.